Our favorite thing about the Hyundai Elantra is that it’s a really, truly good car. It isn’t going to break any world record lap times, and it doesn’t come with optional carbon fiber trim or racing tires, but the Elantra is handsome, feature-packed, reliable, fuel-efficient, and doesn’t leave you feeling like you need more power to get by. But what if you want a little extra power and style, just for kicks? Enter the Elantra Sport, which keeps the Elantra’s unbeatable value proposition but transforms a familiar face into possibly the best-looking economy car we’ve ever seen and gives it the same turbocharged engine found under the hood in the Hyundai Tucson SUV. The Elantra Sport adds 54 horsepower and 63 pound-feet or torque to the standard Elantra’s numbers, a massive improvement on a car that was already fun to drive. Add in the fact that the Elantra Sport can come with either a manual or a dual-clutch transmission, and you have a legitimate driver’s car on your hands for well under the price of cars with similar performance numbers. 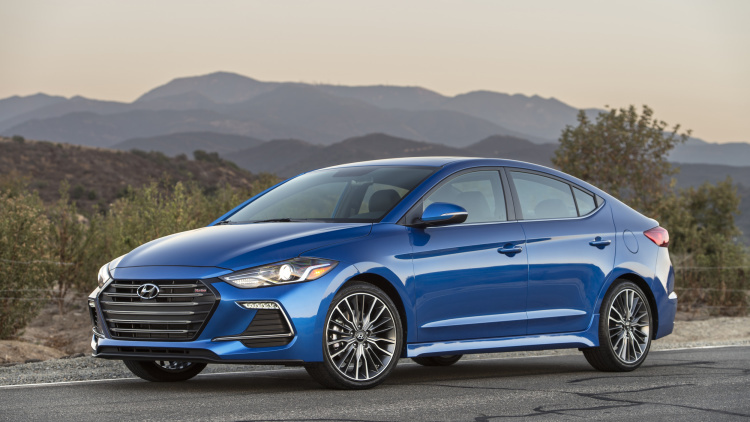 While the Elantra Sport isn’t the kind of BMW-challenger that we know Hyundai’s N Division has in the works, it is a truly remarkable example of Hyundai’s brand strategy in practice. The Elantra separates itself from the competition by offering more features, a better warranty, and more style at a better price point. The Elantra Sport steps its game up enough to have the exact same advantages over slightly pricier competition. In short: we’re looking forward to spending as much time behind the wheel of the Elantra Sport as we have the normal model, because the best car in its class just got even classier!